San Mateo Highlands after dark, in the backyard of the Palmer family, along Lexington Avenue. Marc Rarden (top), seen here with wife Heather and their three children, finds the Highlands “a breath of fresh air.” Above: Inside the Rardens’ kitchen. 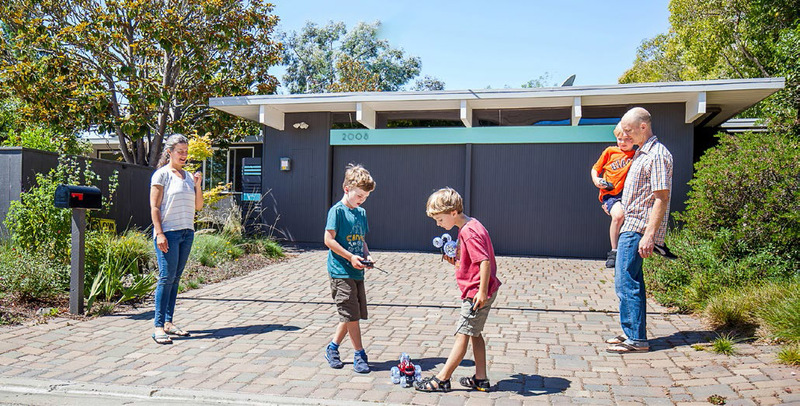 Seven-year Eichler owner Astrid Spencer at home with her three children: (L-R) Mia, Page, and Jamie. 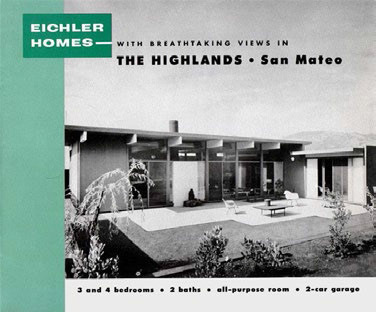 The cover of the original Eichler brochure, which heralded the opening of the neighborhood in the mid-1950s. 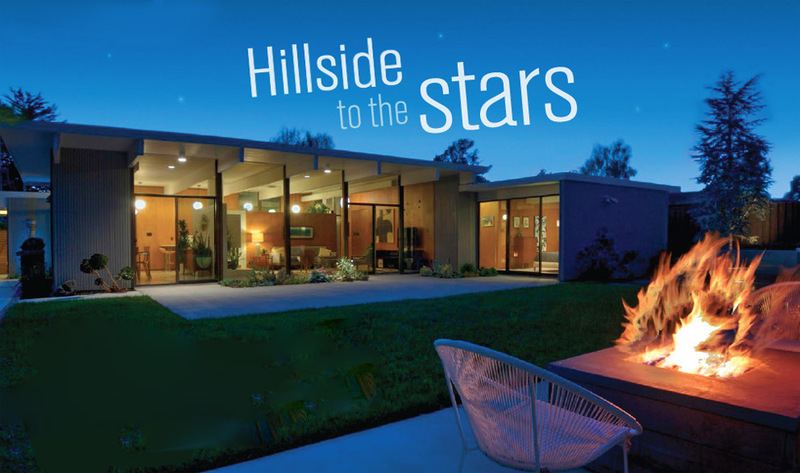 As mid-century modern neighborhoods go, the San Mateo Highlands has always been a superstar. 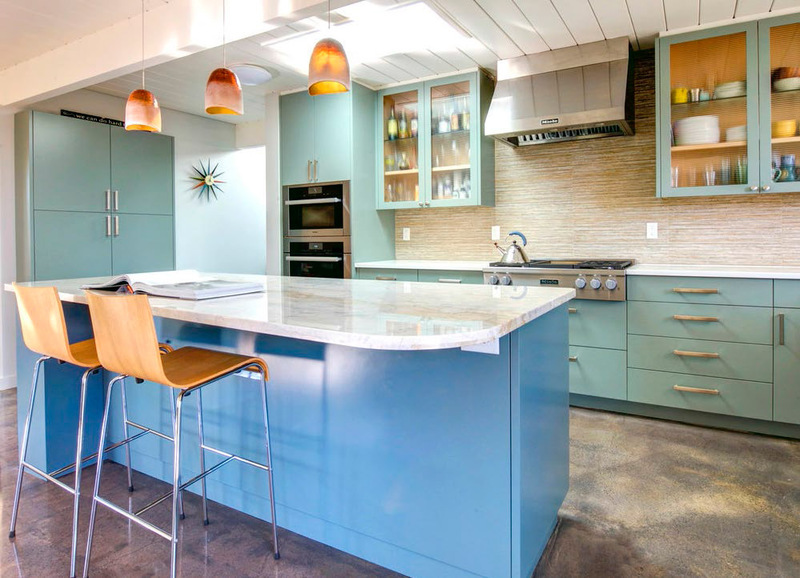 With approximately 650 or so Eichler homes, it is the largest Eichler neighborhood anywhere. And the Highlands is deserving of its name. With homes atop a 469-foot-tall ridge, it's also the highest elevation Eichler tract. From the start fans have poured in, beginning in 1956, to visit not a home they might buy, but to gawk at a vision of the future. This was Joe Eichler's all-steel X-100. About 150,000 people toured the home over a three-month period in late 1956, attracted by coverage in Sunset magazine, Life, and Popular Science. "Everything is so modern it takes your breath away—and your money too, if you bought one," a newsreel gushed. And if some of those tourists happened to stop into one of Joe's model homes while in the neighborhood? Well, that was the idea, Ned Eichler, Joe's son and marketing manager, said in a 2008 interview. The Highlands, with homes built from 1955 to 1964, took another star turn in 1958 when Eichler unveiled the 'Life House,' a startling two-story home designed by Pietro Belluschi, then dean of architecture at MIT. Life, which published the home in October 1958, wanted to help create a modern home for the mass market—and who better to build it than Eichler? Eichler saw the Highlands as a special place, recalls Jerry Grantz, who worked in marketing for Joe and helped sell Highlands homes starting in 1959. That's why he built the X-100 and Life House there, Jerry says. "He wanted to go all out. He wasn't going to miss." Another effort to go all out never came to fruition. In 1961 Eichler had architect Aaron Green, one of Frank Lloyd Wright's leading and most talented followers, design a sort of subdivision within a subdivision on steep slopes in the north end of the Highlands. The homes would have been unlike anything Joe had ever built. Some would have virtually soared above their steep slights. One model, the 'Arrow,' was a series of powerful diagonals. Another was informally dubbed 'the frying pan' because of its curvilinear shape. It's not clear why the homes were never built—maybe the cost. Today, both the X-100 and Life House remain, but they are not what draw crowds to the neighborhood. Yet the crowds still come. Just ask Astrid Spencer. In 2011 she and her husband had just closed on a home there, then began to wonder—why aren't the sellers moving out? "The former owner wanted to adjust the date so we would move in after the 4th of July. We didn't realize this is very prime property for viewing the fireworks." Once a small town-like celebration inaugurated by the Highlands Community Association, folks say, to keep Highlanders at home and off the highway during the dangerous holiday weekend, today the July 3 fireworks and July 4 parade and carnival attract so many people from all over that "on July 3 you can't find a place to park on the street," Astrid says.